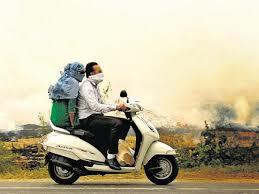 PUNE: People in four localities in Pune have been advised to wear masks as air monitoring system has raised an alarm. Air pollution level is 800 times above WHO safety norms prescribed for Indian conditions. Pune's pollution levels were 100 times above the existing levels on a normal day and 800 times above WHO's safety norms prescribed for Indian conditions on Diwali. Two days after Diwali, the air quality in Pune has still not seen better days. Government Air Monitoring System 'Safar' has given health alert advisory in four areas - IMD Shivajinagar, Katraj, Lohegaon and Hadapasar. The air pollution figures from the Safar Air Monitoring System show that senior citizens, children along with healthy people may experience a blow to their health. The four localities in Pune have been advised to avoid stepping outside and people living there have been advised to wear pollution masks. On Saturday morning, air pollution figures for PM2.5 were air quality index (AQI) 326. AQI 326 corresponds to 154 micrograms per metre cubic of PM2.5, which is three times more than the set standard of air pollution by Central Pollution Control Board (CPCB). CPCB has set the standard to 60 micrograms per cubic metre PM2.5. This means, air having 0 to 60 particulate matter is okay for breathing and 326 PM2.5 means, during this time, people are inhaling 154 polluted air particles which is harmful to the lungs. Apart from bursting of firecrackers, the emission from vehicles and the gases from industries are also responsible for the increased pollution in the air. Dr Sundip Salvi - the director at Chest Research Foundation said, "The breathing zone air pollution figures as per the survey of Chest Research Foundation showed drastic rise in the air pollution from 600 PM2.5 to 40,000 PM2.5 while the crackers were up." This survey was carried out on the day of Laxmi pooja on the busy street and market place area of Laxmi Road in Pune.